LMC Elevators are typical of the innovative nature valued by LMC. By taking our proven, reliable design and upgrading its performance, LMC has created the new standard for gentle-handling elevators. With these elevators LMC strives to provide our customers with a high-performance piece of equipment with an economical price tag. The legging of our elevators can be shipped disassembled, thereby reducing freight costs. The boot is tapered to a drawer action assembly which when opened, completely empties to boot. Built in boot clearance above the floor enables quicker; more effective clean outs and maintains proper sanitation. The “U” Series Easy Dump was designed with height restrictions and spouting limitations in mind. The ability to feed and discharge on the same side allows you to achieve spouting configurations that are virtually impossible by traditional elevators. 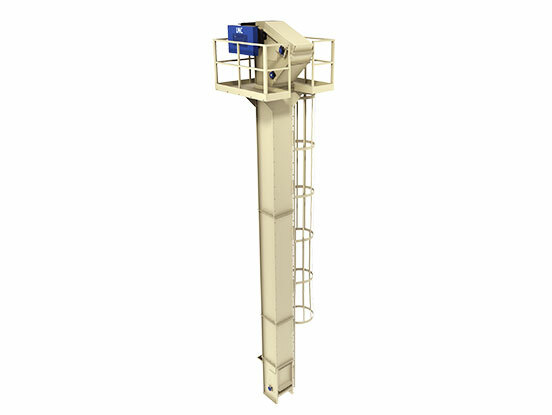 The “D” Series Easy Dump is the ideal elevator for lifting two different products in limited spaces. This configuration gives you the ability to elevate two different product types without contamination. The two separate product in-feeds, bucket lanes and discharge spouts enable the “D” to act as two elevators. The principals of operation for an LMC Easy Dump Elevator are very simple, straightforward and effective. From a spouting system, the product is transferred into the buckets. The buckets travel up the legging until they are pulled around the first set of sprockets as shown in the illustration. The buckets are gently tilted and product dispenses into the discharge hopper. 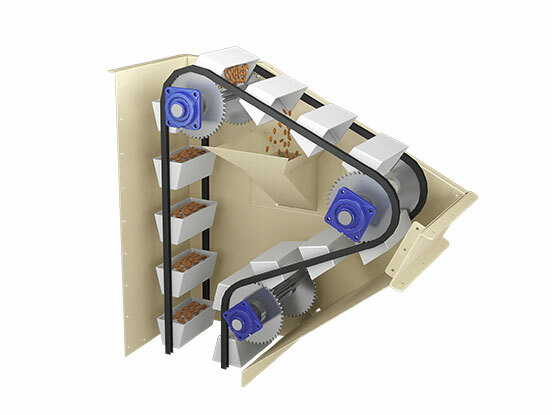 From this hopper the product feeds through a spout to your designated destination. The buckets continue in this cycle and provide a continuous, smooth flow of product with very little damage. Have a question about this equipment?